Franklin Pierce was the 14th President of the United States who served in office from March 4, 1853 to March 4, 1857. What was the life of Franklin Pierce like? The short biography of President Franklin Pierce covers important information and facts about his early life, his family, career and the famous events and achievements of his political life. Our short biography of Franklin Pierce provides an interesting and easy way to learn about the life of the President. The following important facts provide a fast overview of important facts about President Franklin Pierce. Facts and Info: Franklin Pierce was the 14th president of America. Franklin Pierce was incapable of stemming the march towards Civil War and one of his few accomplishments was initiating discussions on acquiring Alaska. For additional info refer to 20 Facts about Franklin Pierce. Facts and Info: He was born on November 23, 1804 in Hillsboro, New Hampshire. His father, General Benjamin Pierce, was an old Revolutionary soldier who raised his family on a farm. Franklin followed this military tradition of his family and then entered politics. Franklin Pierce died on October 8, 1869 in Concord, New Hampshire. Facts and Info: The career of Franklin Pierce included the roles of Soldier, Lawyer, Politician. He was well educated and graduated from Bowdoin College in Brunswick and attended Law School. His military career included his role as a brigadier general during the Mexican-American War. He became the 14th President of America in 1853 and served for 4 years until 1857. 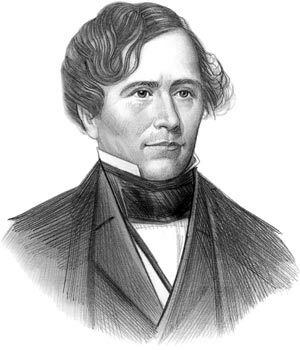 Facts and Info: Franklin Pierce married Jane Means Appleton in 1834. They had 3 children , all of whom died in childhood. Their son, Benjamin "Bennie" Pierce, died at the age of 11 in a terrible train accident in which Bennie was decapitated in front of his father. Facts and Info: Franklin Pierce belonged to the Democrat Political Party. He was 49 years old when he was inaugurated as the 14th president. Inauguration is a President's swearing-in ceremony. His traditional style of leadership failed to dominate other more forceful politicians of the era and the aggressiveness of southerners over the issue of slavery. For additional facts refer to his Presidential Cabinet members. Short Biography of Franklin Pierce: What he was like! Facts and Info: Franklin Pierce was an athletic 5 feet 10 inches in height with a slim build. He had curly dark hair which was slightly gray at the temple, grey eyes, thin lips and a classic Roman nose. He was considered to be charming and handsome, likeable and sociable. His active social life led to him becoming an alcoholic. He was, however, deeply religious and an active member of the Episcopalian church. Facts and Info: The few achievements of Franklin Pierce were in the realm of foreign policy. In 1853 Matthew Perry was the Commodore of the U.S. Navy who compelled the opening of Japan to the West providing important trading opportunities. During his presidency additional land was acquired from Mexico and Pierce initiated discussions on acquiring Alaska from Russia. The Kansas-Nebraska Bill created the territories of Kansas & Nebraska opening new lands for settlers and possibilities for expanding the railroad. The Act allowed settlers to determine if they would allow slavery within their boundaries as a concession to the slave power of the South. The Act set the nation on its path to civil war. The Ostend Manifesto showed how far the South was willing to go to acquire more territories favourable to slavery. Facts and Info: During his life Franklin Pierce suffered from depression, tuberculosis and alcoholism which resulted in cirrhosis of the liver. As president, he had respiratory problems and a persistent cough which was due to chronic bronchitis. At the termination of his official career he went to the Island of Madeira for the benefit of his wife's health, and subsequently travelled in Europe. Facts and Info: He died of stomach inflammation caused by alcohol on October 8, 1869 in Concord, New Hampshire. Franklin Pierce was buried in the Old North Cemetery a few blocks from Concord. The short biography of Franklin Pierce provides a fast overview of the key facts and events about his life and the accomplishments of his presidential term in office. The following Franklin Pierce video enables you to sit back and listen to the history of his personal and political life - a useful educational resource for kids, children and schools learning about the life of President Franklin Pierce.